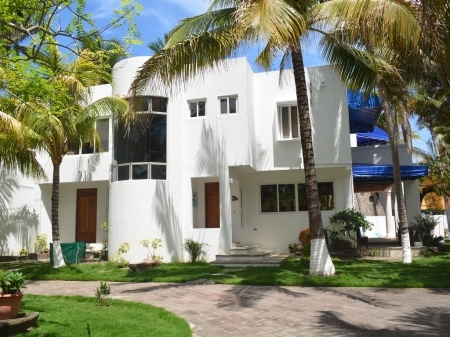 Come and enjoy this beautiful "CASA BLANCA BEACH FRONT" home, located in Playa Costa del Sol, only 20 minutes away from the airport and 45 minutes to the city of San Salvador. 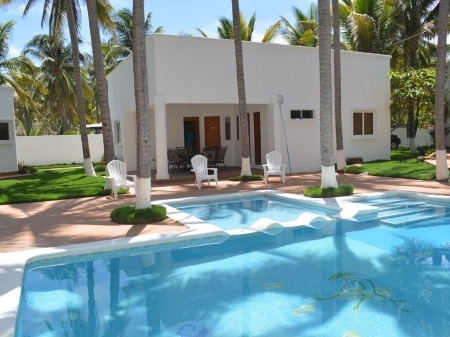 Casa Blanca is a very well kept modern house design with clean, open spaces where you can enjoy the view of the ocean and pool area from any angle of the house. You can have a peaceful nap on one of the hammocks under the palm trees, the sounds of the waves and the refreshing breeze of the ocean. We have excellent sunny, tropical weather, and warm year round. 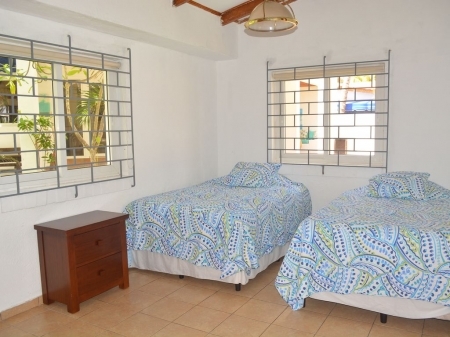 We have lots of coconut trees.You can have a lot of fun, some of the very fun things you can do here are playing and having fun with your family at the pool, spend your mornings at the beach playing in the sand, and after a delicious lunch have a siesta in our comfortables hammocks. Your evenings watching the sunset together with your family, and the stars at night are spectacular. 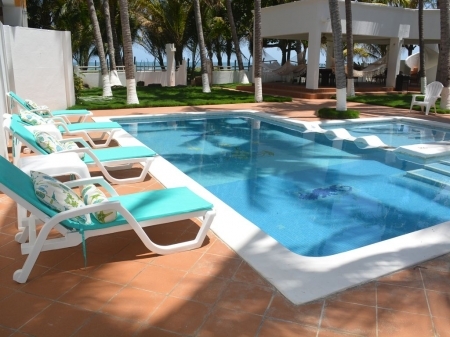 The peace that you feel at casa blanca beach front is hard to find any where else. This is the perfect place to relax and enjoy life at the beach!!! 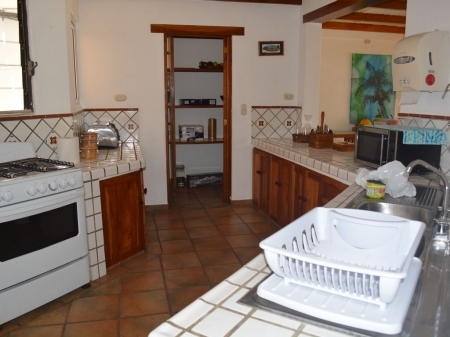 As you enter the property you will see the drive way and gardens with lots of coconut trees and when you walk into the house you will see the a fully equipped kitchen with all the necessary cooking utensils, all kitchen appliances, don't need to bring anything just your luggage, and your joy. 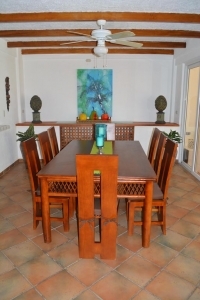 To your right the comfortable living room where you can have lots of laughs while enjoying a relaxing glass of wine, and right in front of you the graciously decorated dining room with an excellent ocean view. All of our furniture is custom made in El Salvador from the best woods of our country. 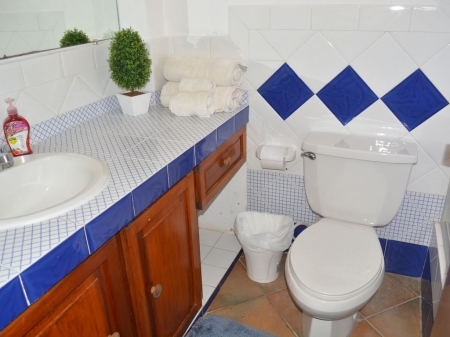 We also have a separate laundry room area with an additional bedroom and full bathroom. 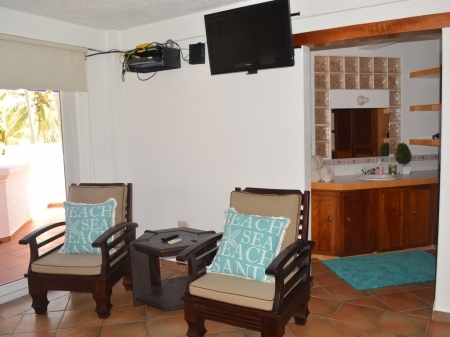 We also provide a service person to clean the the rooms and help in the kitchen.There is also a keeper who takes care the house gardens, pool and security inside the property. 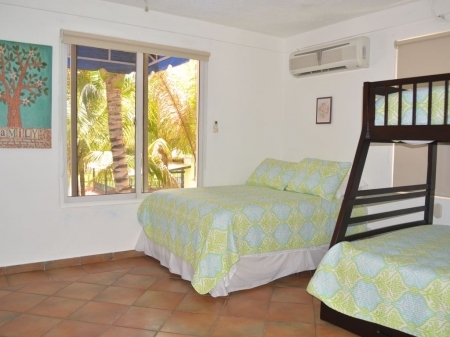 Master Bedroom # 1: king size bed, a/c, ceiling fans, cable tv, wifi. Bedroom # 2: one bunkbed upper bed twin/full and lower bed full/queen, one full/queen bed, a/c, ceiling fan, cable tv, wifi, full bathroom as well. Bedroom # 3: one bunkbed upper bed twin/full and lower bed full/queen, one queen size bed, a/c, ceiling fan, cable tv, wifi, and full bathroom. 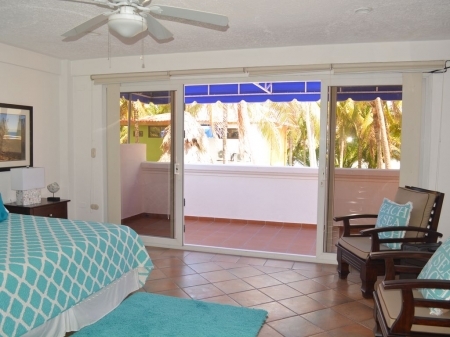 This bedroom also has a connecting balcony with the master bedroom, from this balcony you can enjoy the whole view of the swimming pool, sunset , coconut trees, and the ocean. 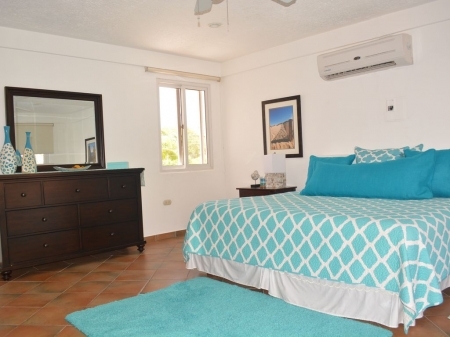 All bedrooms have beautiful outside views, air conditioning, ceiling fans w/light, remote control led tv, cable, wifi, wardrobe and bathroom amenities. The master bedroom has a large bath tub for couples to enjoy. 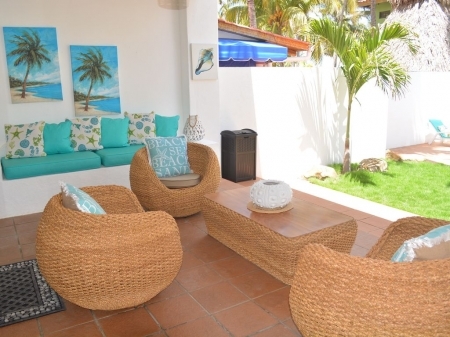 There is also a spacious sun deck right by the pool area and facing the ocean, this deck includes a mini bar and ceiling fans and it's ideal for entertaining, the perfect spot for barbecuing and to spend wonderful times with friends and family. There are some hammocks hanged around this deck so you can fully relax with a tropical drink in your hand and have the best of times from the comfort of your hammock and all your friends around you. You can also go upstairs this deck and find a enormous balcony area ideal for sunbathing. Our main goal is for you to have an awesome time, and enjoy your vacation. You can be sure that after a couple of days in this paradise, you'll never want to leave. Main entrance to the house. Swimming pool with view to the ocean. Terrace lounge with ocean view. Stairs up to the second floor. Master bedroom with balcony and ocean view. Little star to enjoy your wine at night. 3 bedroom ranch with 2 full bathrooms. Bedroom #4 by the pool. Ranch bathroom in bedroom #4. 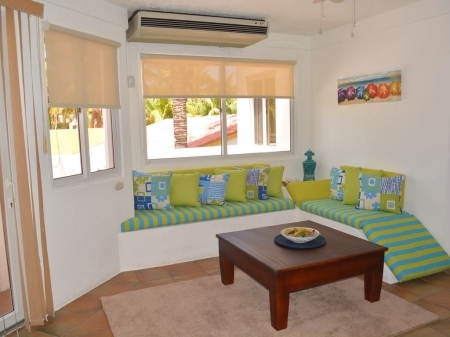 A beautiful house, has the feeling of a Resort with all the amenities necessary to enjoy the stay.. 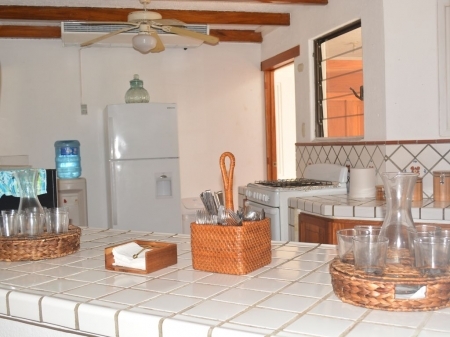 The house is perfectly located within feets off the beach and nearby restaurants. It\'s beautifully designed to fit all practical needs, clean and well manicured inside and out. The owner was exceptionally friendly and complimented us with a nice baskets of well received goodies. The helpers (Carolina and Miguel) were also exceptionally helpful and ready to assist and service our every need. The Cook prepared a delicious dinner for us while we celebrated a birthday. A FABULOUS experience from beginning to end. Dear Rina, Thanks for allowing us to share your beautiful beach home for our family vacation. Casa Blanca was just what we wanted for some quality family time. Everyone enjoyed it and walked away thinking about our next time. Your home is very spacious and comfortable. The staff (Miguel and Carolina) were so helpfull and went out of their way to spoil us. The ocean was great, we spent quality time every day enjoying the waves together and playing on the beach and then moving the pool. My sister in law and I took long beach walks every morning before breakfast. The mosquitios were not good once the sun went down, but we spent the evenings indoors playing games. We had nice thunder stroms almost every nite that cooled off the nite. So all in all, Outstanding! Thanks and untll next time. Best wishes, Carlos, Elisa, and family. The perfect property for a large family. We had a great time. The place looks exactly like the photos. The staff, Carolina and Miguel were very helpful and attentive. 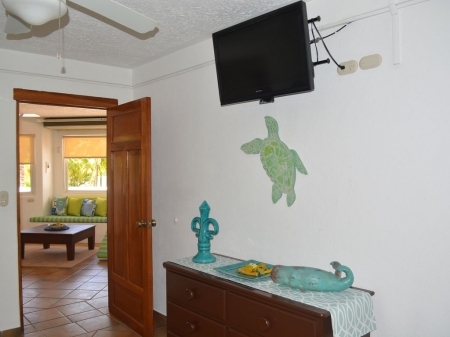 The house is right on the beach and close to restaurants and markets. 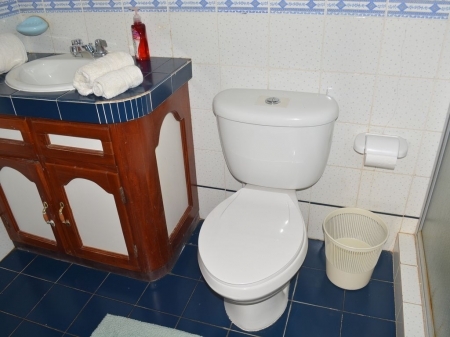 The house has everything you need for a comfortable stay. We spent 4 nights in Costa del Sol and had a very nice stay. I would definitely recommend it. Nosotros visitamos El Salvador por primera vez y regresamos a Guatemala con una muy buena impresión de este lindo país! Tuvimos una experiencia única en esta linda casa frente al mar, realmente excedió nuestras expectativas. La pasamos \"bomba\" como dijeron los niños. 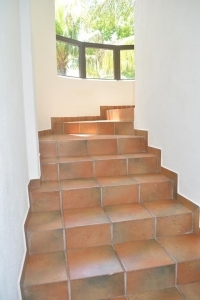 La Casa está decorada con muy buen gusto y está muy cómoda con todo lo que se necesita para una estadía placentera. El paisaje, La Casa y el personal hacen de tu estancia unas vacaciones perfectas. Miguel Ángel, Carolina y Rosita no pudieron haber sido más amables y serviciales. Recibimos un servicio 5 estrellas de parte de ellos. Rina es una excelente host, nos hizo sentir como en Casa. Ella es muy detallista, accesible y amable. Estuvo pendiente de nosotros en todo momento y estamos muy agradecidos con ella por todas sus atenciones. Es un lugar familiar para descansar, divertirse y relajarse. Definitivamente Casa Blanca Ocean Front es muy recomendable. Nos encantó todo, esperamos volver pronto. My large family (10 adults and 9 children) coming from the US and Canada, just returned from a two week holiday at Casa Blanca and we couldn\'t be happier with our experience. Carolina and Miguel, the caretakers, and Sonia, the cook, took impeccable care of us and were wonderful in every way. The food was amazing and the property and rooms were perfectly clean. Whether offering an umbrella while at the beach, accompanying us to the store for groceries, arranging to buy local fresh fish or having a man come to the property to cut fresh coconut from the trees, every effort was made to make us feel welcome, safe and very well taken care of. We also had a rotating night-time security guard, both of whom were friendly and kind. Rina, the owner, though living in the US, facilitated the whole vacation, answering questions, helping us translate when we couldn\'t understand something and even having a wonderful welcome basket and groceries ready for us when we arrived. She had someone meet us at the airport and ensure that we picked up our rental car and got to the house safely. 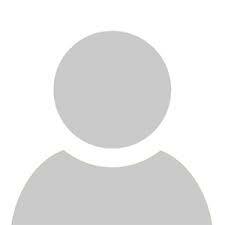 I could go on an on... The kids spend hours in the pool each day and we enjoyed reading in the hammocks, playing games and eating in the outdoor living areas and relaxing. The beach was wonderful and we all loved playing in the waves. It\'s a nice long shallow beach and mid-tide was perfect for playing in the sand and the waves. Though it isn\'t necessary to speak Spanish, it certainly made it easier for us to have a couple people who knew enough Spanglish to get us through. :) The local water park (15 minutes away), Atlantis, was a very fun outing. Though it won\'t win any safety awards, we spent 2 very fun days there. Go on Thursday to avoid the crowds, both times we went we almost had the place to ourselves. Though initially we had some concerns about safely, we felt perfectly safe on the huge property, on our outings, and getting groceries in town. 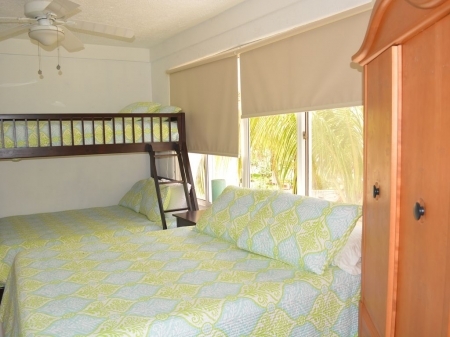 I highly recommend Casa Blanca to families wanting a place to relax and enjoy quality time together. We stayed at Casa Blanca in December of 2015. My husband and I were attempting to coordinate a family reunion of sorts and we had lots of worries due to safety concerns in the region. But staying at Casa Blanca was THE BEST decision we could have made. We were very safe, with our own security officer. I would get up in the morning and run along the beach and he would go out and keep an eye out for me. The staff was absolutely attentive, we couldn\'t have asked for more. It is VERY reasonably priced and well worth every cent. The house is very roomy and clean. The food was absolutely delicious and again the staff made all of the difference in the world. Lastly, but certainly not least, Mrs. Rina the owner was so patient and gracious by very promptly responding to all of our questions leading up to the trip and even while there she checked in on us to make sure everything was going great. We think about our week here often, and our memories that were made there will last forever. We\'re thinking of doing it again soon and I hope this house is available again for our dates, we would LOVE to stay here again! 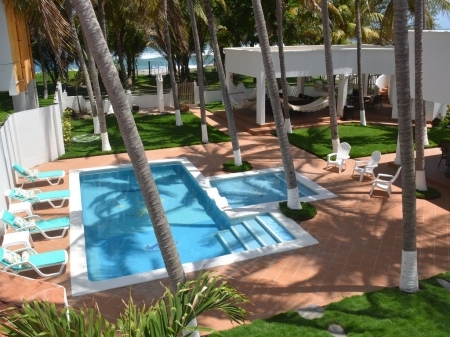 Staying at Casa Blanca was a memorable experience. I stayed with my family for about 5 days- June 28, 2016 until July 2, 2016 and i did not want to leave. The staff was fantastic and attentive to all of our needs. They went up and beyond to make us feel at home and treated me like a Queen. I think everyone in the world should considered staying here at some point. The staff was generous and the house was gorgeous. The pictures do not do justice for how beautiful the house really is. It was well kept and extremely clean. Even though the owner was not present she called to make sure we had everything we needed and to ensure we were satisfied with our stay. I loved it and I have referred it to all my friends who visit El Salvador for vacation. I would absolutely stay at Casa Blanca again. We stayed for 4 nights at Casa Blanca and our family had a blast. The beach was right at your door step and the pool was a hit with the kids. The caretaker and his wife were amazing and so friendly. He would go to town for us when we needed something. It is also only a 15 minute drive to the Atlantis Water Park, which is a great time. 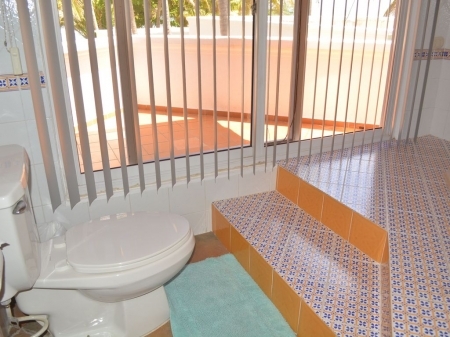 I would recommend this house to anyone looking for a place on the beach in Costa del Sol. I spent the weekend at Casablanca and couldn\'t have been happier. The home was beautiful, clean, very spacious and just a few steps to the beach. We opted to have a cook available who was fantastic and cooked delicious meals everytime. We couldn\'t have chosen a better place for a quiet, beautiful and relaxing weekend at the beach. I would recommend Casablanca to anyone. You will not regret it. Cheers! My family and I rented this house for a week, my only regret is that we didn\'t stay longer!! Gorgeous beach house, I could tell, that the owner took her time to decorate the house, with such quality and elegant furniture.. Waking up every morning to the sound of the ocean and the amazing ocean view was definitely paradise! Marisela, the housekeeper is a phenomenal cook and she and her husband will shower you with their kindness! The driver was so punctual and professional. We felt right at home, as we quickly put on the bathing suits and got into the beautiful pool that looks over the ocean. It\'s a sight that really is hard to put into words! My family and I can\'t wait to go back to El Salvador, and book our vacation at Casa Blanca! Thank you to Rina, the owner for allowing us to rent her beautiful home and I hope that this will not be the last time! We stayed at Casa Blanca for 4 nights and had a great time. Rina, the owner provided all information as required and was a great contact, and Daniel the housekeeper attended to our every need. 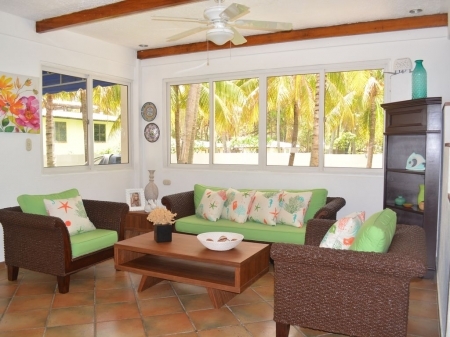 The house is great, very comfortable and well equipped, and the beach is beautiful and at your doorstep.